Testifying in court is an art, one that can only be mastered through practice and experience. The next time you are called upon to take the stand, remember that as a witness you are the artist. The audience—in particular the judge—is your canvas. Your paintbrushes are the words you choose and your paints are the facts you have to relate. Although you must never change the facts, the way you apply them to the canvas can make all the difference. 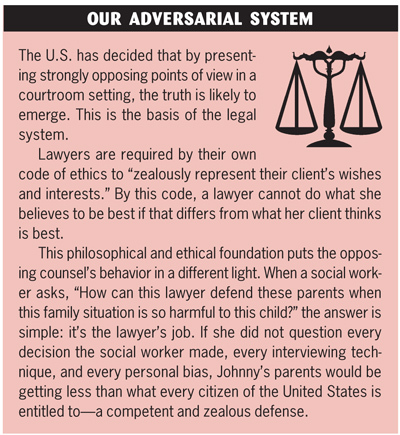 This article is for those of you who, as part of your work in child welfare, must occasionally take the stand and paint a picture for the judge. 1. Always tell the truth, even if it hurts. If you don’t, it is sure to come back on you in some way. When you get caught in a lie, even a “small” lie, it forever hurts your credibility in the eyes of that judge. A lie will not only impact your credibility in the case at hand but in every case for which you testify from that point forward. 2. Don’t be afraid to admit you didn’t hear or understand a question. Most lawyers love the sound of their own voice, so chances are they won’t mind repeating what they have said. 3. Stop talking when someone says, “Objection.” The judge will tell you whether to answer the question. 4. Don’t forget: always tell the truth. Remember your mother telling you that you can never take back your first impression? This is especially true for the professional testifying in the courtroom. Therefore, your first impression must be strong and positive. Dress appropriately. Wear professional, conservative attire. Your demeanor during court proceedings should be equally professional. Behave properly. While you are waiting for your case to be called, be attentive, quiet, and respectful. The judge is observing more than just the parties at hand. This is particularly true if you have a presiding judge who is a stickler for certain issues. For example, if the judge does not like drinks or food in the courtroom, do not be the person who gets called out for having drinks and food in the court. You run the risk of making the judge angry at you before you even start, and you set a poor example for others who have less exposure to the court system. Body language is key. Stand and sit tall in the courtroom. Your body language can exude confidence or weakness. When people are teaching self-defense classes, it is often taught that muggers profile their victims. A person walking slouched over with his eyes cast to the ground is more likely to be prey than someone who is aware of his surroundings and walking upright. Let your body language signal to the opposing party that you are not going to be the next victim. Speak to the court with respect. Even if you do not respect the judge on a given day, give the court the respect it deserves. The court is the best system we have for resolving controversies and administering justice in this country. The ideal and principles that stand behind the courtroom are to be admired and respected by all. In Alamance County, I have the luxury of the being the in-house attorney. That means I can often meet with workers prior to court to help them organize, predict, and prepare. Yet because in-house attorneys are fairly rare, I’d like to give you a few tips for preparing yourself prior to a court appearance. Do good work. Although you may think your initial presentation to the courtroom is your first opportunity to impress the court, the truth is that you begin preparing your testimony the moment you begin working with a family. The best method for having good testimony is to follow best practices in your work. In addition to doing the right thing, you will feel more confident and secure knowing that your underlying work is thorough and can withstand the scrutiny of the opposing party. Review and make notes. Prior to court, review your records. When social workers come to my office, I hand them large note cards on which to make the notes they will use during testimony. Reviewing the file and taking notes helps them internalize information and keep it fresh. When they are on the witness stand, the note cards are easier to use than large pieces of bulky paper. The truth is, once workers have put all that effort into preparing, they rarely have to refer to notes. When a worker does not review the file prior to court, the testimony often comes across as sloppy, unorganized, and less credible. Put yourself in the judge’s position: every time a question is asked, the social worker must take long pauses to flip through voluminous records. At some point, you will begin to think that this case is not important to the worker. Although a witness should feel free to think and take time when answering questions, taking long pauses can cause frustration for those waiting. Be prepared. Know your case. opportunity to think through those weaknesses and develop an appropriate response. When you are reviewing a case and discover a huge flaw, bring that to the attention of your attorney immediately. Often it is better for your attorney to intentionally bring out a weakness than to have it brought out by the opposing attorney during cross-examination. This can also add to your credibility. Now you are on the witness stand. What should you do? Stick to the facts. The court wants facts. Do not share your opinions unless asked to do so. The facts should not be clouded by your emotion or feelings. If you do give an opinion you should be able to back it up with facts. Do not be afraid to say you don’t know or do not remember when asked a question. On one occasion, a social worker was asked what happened in court. Unfortunately, she could not remember. Rather than admit this, she proceeded to talk about what she thought happened, which led her to talk about what she thought the judge was thinking. At that point I was forced to object to my own witness! However, the judge was so amused he encouraged her to continue. It was not a good moment. Avoid jargon and acronyms. Assume your audience knows nothing. If you do use social work lingo, explain what it means so everyone will be educated and understand. This is also significant when you consider that the case could be reviewed by another court on appeal. When you explain a term in court your explanation enters the record of the proceedings; this ensures the appeals court will understand what you are talking about. Do not fear cross-examination. If you have taken all the steps above to prepare, you are prepared for cross-examination. During cross-examination you must keep your composure and professional demeanor. examined by the relatives’ attorney. The foster mother became very angry because she was being criticized for her treatment of a family member. The foster mother lashed out at the attorney, judge, and family member. From that point on, she had no credibility with the judge. When she was explaining to the judge the difficulty the children were having with visitation with the relatives, the judge’s eyes glazed over. Take heart. No one is comfortable on the witness stand. However, you should never feel alone on the witness stand. Your attorney is your ally. He or she will help jog your memory when you get lost and try to guide you back when you go astray. You are not alone. Remember, every time you testify you are crafting your art so that you will be better the next time. You will mature and improve with time. You will learn what to expect and how to handle situations. Do not be afraid to self-critique after you testify or ask someone where you did well and what areas could use improvement. Believe it or not, attorneys do this as well. You are now prepared to go into the world of testimony. Remember to paint your picture for those who have never seen it before. When you get off the witness stand, your audience should be able to envision what you yourself have lived!